Home » Academics » Schools » College of Arts, Humanities and Social Sciences » Faculty » Kathleen M. Gallagher, Ph.D.
Kathleen’s work in Nepal and South Asia focuses on marginalized communities such as squatters, internally displaced populations, bonded laborers and girls at risk for human trafficking. Her vocational interests are rooted in a desire to apply rigorous scholarship to people, stories and situations that might otherwise go unseen or unheard. Her research has been featured in an assortment of journals including the Journal of Contemporary Ethnography, Crossing the Border, Human Organization a special edition of Studies in Law, Politics and Society, Journal of Clinical Psychology and other publications. She regularly presents her research findings at conference venues at home and abroad. Kathleen’s research and writing address a range of issues including the structural production of inequity and the everyday violence of poverty; socioeconomic development, democratization and post-conflict transition; asylum, legal proceedings and the translation of trauma and suffering; and ethics and anthropology. Kathleen further pursues these interests through the provision of expert witness for political persecution and at the Center for Refugee Services in San Antonio. Kathleen has been fortunate to receive generous support for her fieldwork and research from a variety of organizations, including the Social Science Research Council, Institute for the Study of World Politics, Mellon Foundation and International Rotary Foundation. Her writing has additionally benefitted from scholarships provided by Sarah Lawrence College and the New York State Summers Writers Institute for Advanced Nonfiction Prose. She is also a two-time Fulbright Scholarship recipient. Kathleen delights in creatively mentoring the passions of her graduate students, who have presented research papers and conducted roundtables and workshops around the country and with whom she co-founded a non-profit for malaria relief and graduate student organization for cooperative international development. Recent learning innovations include the collaborative research of sustainable development initiatives for women utilizing digital scholarship. She is a recipient of the Distinguished Faculty Award (St. Mary’s University) as well as the Alice Wright Franzke Feminist Award acknowledging those who promote peace, empowerment, civic engagement, cooperation, equality, and respect of all persons. Kathleen was recently asked to serve as a mentor for Collegium, a national Colloquy on Faith and Intellectual Life that examines and seeks to integrate intellectual and spiritual dimensions of one’s vocational life. As a Marianist Educational Associate, her classroom, research and outreach are inspired by the ideals of preferential option for the poor and education for the common good. 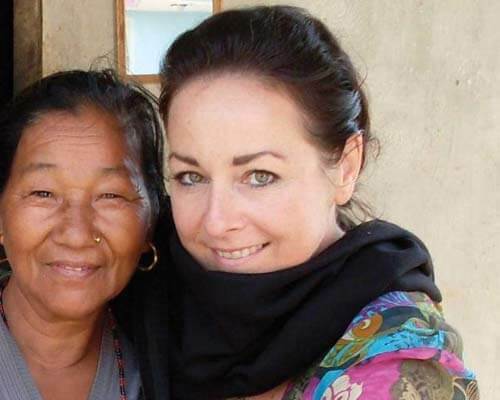 Kathleen completed her undergraduate work at the University of Scranton in philosophy and psychology, her master’s degree in sociology at Tribhuvan University in Nepal and her doctoral studies in anthropology at Harvard University. She is currently an Associate Professor in the Graduate International Relations Program, St. Mary’s University and a Visiting Scholar at the South Asia Institute, University of Texas, Austin. Whether in the Rockies or the Himalayas, during her free time Kathleen loves exploring the mountains, especially in Colorado in the company of her nieces and nephews.